A powerful piece by Ibsen. Notice the title. 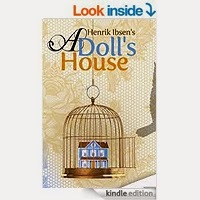 It is A doll's house and not The doll's house. Very important distinction for she is his doll wife and is treated accordingly. It is easy for us to dismiss Nora as a spoilt little girl. However throughout the play she struggles towards independence and Torvald in the final scene is a broken man. The slamming of the door as Nora leaves abandoning both him and the children is a symbolic act. It is an act of defiance that has echoed through time. A great play and I think one that is still relevant.